The dead have never been a problem on The Walking Dead. It’s the living you really have to worry about. Of course, that was kind of the point all along — it’s right there in the show’s double entendre of a title. In a perfect world, AMC’s flagship show would be as beloved for the psychological depth of its sentient characters as it is for the savage appetites of its extras. This never quite happened, though. Despite the truly Herculean efforts of the drama’s most recent (and most successful) showrunner,1 Scott M. Gimple, who has at least nodded in the direction of emotional development while coming up with new reasons for people to wander into abandoned pharmacies, The Walking Dead remains defined by its brainless antagonists. But let’s be honest: Nobody minds. It’s the highest-rated show on television, with a devotion among the advertiser-coveted 18-to-34-year-old demographic that HBO’s Michael Lombardo would literally devour AMC’s Joel Stillerman to achieve. As long as Gimple and his latex-whisperering producer, Greg Nicotero, keep the grisly kills coming, The Walking Dead’s characters can continue circling those same Georgia woods and/or the leaky drain of nihilism — you say tomato, etc. — and millions of fans will be perfectly satisfied. With such a remarkable blueprint for success in hand, there was never any question AMC would attempt to Xerox it. The only question would be how. A few years ago, I advocated for one of two scenarios: either an urban setting populated by smart professionals — think D.C. emergency room doctors, not backwoods sheriffs — or a straight-up anthology series. The former would allow a healthy amount of distance from the mothership. The latter would give Walking Dead creator Robert Kirkman a chance to behave like an entrail-streaked Sandra Lee, adding his signature blend of guts and gore to any number of prefab premises, from cop procedural to Western. Instead, Kirkman did what I least expected: He bypassed the predictable machete for another swipe at the brass ring. Fear the Walking Dead, premiering this Sunday at 9 p.m. ET on AMC, has zombies, sure, but what it also has is people: normal, hardworking, problem-having people, the type who canoodle beneath the bleachers and shop for gluten-free bread. Unlike the hardy survivors on The Walking Dead, none of these people appear prepared for the apocalypse — they’re barely ready for Tuesday. 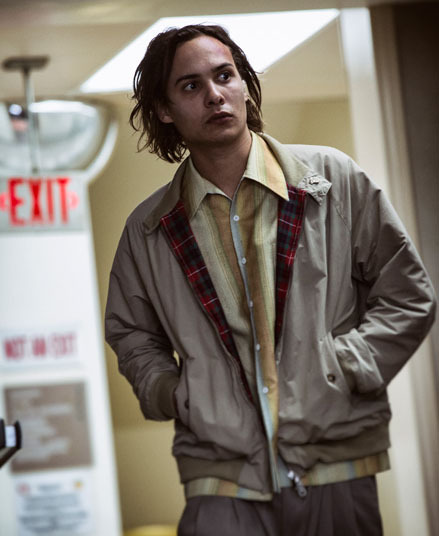 Despite the first word in its title, Fear the Walking Dead isn’t overly concerned with freaking us out. What it wants is for us to care. This is a fairly radical notion for a franchise that, up until now, has been far more successful when cracking open chests than when investigating what might be beating inside of them. But going by the first two hours of Fear, Kirkman and his hand-selected showrunner, Dave Erickson (Sons of Anarchy), have learned from previous mistakes. Fear has more than adrenaline on its side. It has a pulse. Rather than cannonball us, once again, into a deep pool of dystopia, Kirkman and Erickson smartly begin their new show by parking themselves right on the water’s edge. In Sunday’s pilot, the world is continuing more or less as normal. Sure, there are some loose reports of a nasty flu working its way across the country, but the only hysteria on the radio comes from sports call-in shows. Though specifics of time are never mentioned (and no crossovers are planned), it’s clear that Fear is focusing on the period before The Walking Dead’s 2010 pilot, a moment just before everything went to hell. Not that life is easy, of course. One of the sharpest choices made in Fear the Walking Dead is the way it doesn’t rush past the frustrating banalities of existence en route to the apocalypse. Perspective matters: We need to appreciate the leaky faucet before we can attend to the gushing artery. Which is why Kirkman was wise to choose a broken family to serve as our Dantes in this soon-to-be-broken world. The fierce Kim Dickens (Deadwood, Friday Night Lights) plays Madison Clark, a guidance counselor in a Los Angeles public high school. She’s got two kids of her own, high-achieving junior Alicia (Alycia Debnam-Carey) and 19-year-old Nick (Frank Dillane), a barely functioning heroin addict. Maddie is shacked up with steady Travis Manawa (Cliff Curtis), an English teacher2 struggling to stay connected to his own teenage son Chris (Lorenzo James Henrie) and to maintain a fragile peace with his ex-wife, Liza (Elizabeth Rodriguez). It’s strung-out Nick who first encounters the zombies — Kirkman and Erickson cleverly front-load a glimpse of them into the opening minutes to hook us in before pumping the brakes. But were they real or just a drug-driven hallucination? Besides, for much of the pilot, Maddie and Travis are occupied with more familiar stresses: Where are the kids? What’s for dinner? The energy of everyday Los Angeles is captured brilliantly by director Adam Davidson. From snarled freeways to sun-kissed beaches, every scene is bathed in the impossibly bright light of Southern California. It adds a crisp, dreamlike quality to everything that follows: How could anything ugly happen in a place so beautiful? It’s a fantasy shared by the characters, even as videos of gunshot victims climbing out of gurneys begin to hit the Internet. “If there’s a problem, we would know about it,” Maddie says to a knife-packing student who appears to have at least a working knowledge of George Romero movies.3 Fear does a nice job of undermining the subconscious faith in institutions that props up comfortable lives and keeps us from going crazy or at least going H.A.M. Kirkman isn’t exactly David Simon, but both men do have a contagious pessimism when it comes to entrenched power structures. Who’s going to save us from the monsters if the cops and politicians can’t even save themselves? One plus of setting the action pre-collapse is that it considerably lowers the bar for credulity. Unlike Rick Grimes and his unmerry men — who really should know better by now — it makes perfect sense for someone like Travis to take a solo stroll into a dark building in search of answers. And it also allows Kirkman & Co. to essentially do doughnuts on The Strain’s front lawn: While the FX show can’t seem to settle on a threat level for vampire-infected Manhattan, Fear provides a disturbingly probable ticktock for the breakdown of modern society. Every time the sun sets or a cell phone battery dies, a crucial bit of hope goes with it. The zombies, when they appear, are friends and family, not intestine-dragging randos. Eventually, everyone is touched. Bit by bit, everything fails. The Walking Dead is a show about surviving. Fear, by contrast, is about losing. What makes this bearable, at least in the early going, is the strength of the performers. Dickens and Curtis are both outstanding, able to act tough without forgetting that the heart is also a muscle. (The most striking image so far is the sight of Dickens, her clothes spattered in the blood of a colleague, breaking down in the bathroom, a bright purple loofah visible just above her heaving shoulders.) And Dillane and Debnam-Carey are both mature enough to avoid the potholes caused by most young actors (hi, Carl!). Their characters are willful, but not actively dumb. It’s a strange compliment to say I’m not looking forward to seeing any of the main cast — which eventually grows to include the great Rubén Blades and Mercedes Mason — savagely dismembered. But here we are. With Fear the Walking Dead already renewed — six episodes will air this summer and a full 15 will arrive in 2016 — there are two caveats worth mentioning, one minor, one anything but. After taking full advantage of the east side of Los Angeles in the pilot, Fear’s production followed the tax money north of the border to Vancouver, resulting in a much grayer and blander-looking show in subsequent episodes. This is a huge shame. Sure, AMC is wise to pinch pennies when it can, but The Walking Dead is basically a cash factory right now. Committing the dollars necessary to keep the spinoff looking vibrant and distinct strikes me as a worthwhile expense. My larger concern stems directly from the pilot’s success. I’m thrilled that Fear was able to get me to invest in its vision of the end of the world. But are we sure Kirkman and Erickson are qualified to handle that investment with care? On The Walking Dead, even the most finely drawn characters are understood to be grist for the story’s ravenous mill. We cheer when they survive but are resigned to watching them die. Fear’s protagonists, however, still aspire to more than just making it through the night; the full scale of horror is yet to come. As such, one of the most devastating moments in the second episode is among the most subtle. Maddie’s neighbors are throwing a birthday party for their 9-year-old daughter. Unsurprisingly, almost no one shows up. At one point, while Alicia and Nick converse inside, we can hear the 9-year-old weeping across the street. Her day is ruined; we know her future is, too. I found the sound of her tears more upsetting than the squishing of a thousand zombie skulls. Emotions like these are tricky to articulate; they’re more dangerous than any stockpile of ammunition. Storytellers don’t need a permit to wield them, though perhaps they should. For five seasons now, The Walking Dead has made a mockery of the suggestion that hope is as essential to long-running TV series as cameras or craft services. But that show is about rugged stragglers growing comfortable at rock bottom. Fear, by contrast, is prelapsarian. Committing to the story of Maddie, Travis, and their family means committing to a one-way elevator ride straight down. And that strikes me as a big ask. Years of perfectly pierced foreheads and impeccably aimed crossbow bolts have lessened my fear of the walking dead. But I’m absolutely terrified at the thought of seeing these particular people die. So, mission accomplished? Fear the Walking Dead is surprisingly satisfying. I’m just not sure I’ve got the stomach for more. If you’re counting at home, Gimple was TWD’s third showrunner in four years and the first to actually get it right. One positive thing about English teachers is that they’re always good for a bit of heavy-handed allegory. “[Jack] London is trying to teach us how not to die,” Travis tells his class just before they’re all turned to kibble. God, I wish Fear had dropped the mothership’s insistence on outlawing the word “zombie.” It’d make things so much easier if they’d just revealed that “biters” was a regional nickname, kind of like the way they call soda “pop” in Minnesota.